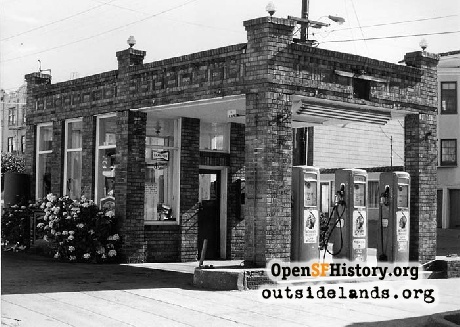 The story of the beautiful 1920s gas station on the corner of 16th Avenue and Irving Street. Originally appeared in WNP Member Newsletter, January 2013. In its heyday, the gas station at 16th Avenue and Irving Street provided gasoline and automobile servicing, as well as new and used Pontiac cars., circa 1940 - Courtesy of a private collector. Next time you’re in the Sunset District, go to 16th Avenue and Irving Street to see a piece of history. The now-closed gas station on the southeast corner was once a neighborhood fixture and may soon be gone. This is the story of the old Mohawk gas station and Jack Goldsworthy, who owned the station and lived next door until his death at the age of 86 in October 2012. I was fortunate to interview Jack Goldsworthy in October 2007 and to meet his family and friends in October 2012. I remember Jack as a kind, funny man who was generous with his time and memories. His words in this article are from our 2007 interview. Jack Goldsworthy as a young man. - Courtesy of Karen Olson. 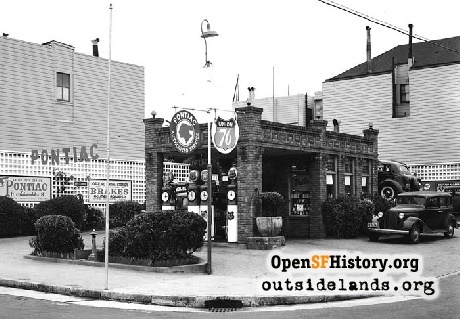 Also in 1926, Jack’s maternal grandfather, Charles Kleinclaus, opened the gas station at 16th and Irving. The 1930 City Directories list Kleinclaus as “jr mgr” of the Sunset Service Station on the “SE corner of 16th Ave” and Irving. At the time, he lived at 1314 16th Avenue, in the house where Jack later lived. According to Jack, this house once sat on Irving Street near the corner. His grandfather had the house moved to 16th Avenue to make more space for the gas station. He also built the apartment building next door on 16th Avenue. For many years, the station sold Mohawk gasoline and serviced cars in the white building behind the station. The Jack Goldsworthy home stands on 16th Avenue next to the station., circa 1968 - Courtesy of Karen Olson. Jack remembered that the years at the Sunset Station were rough. They were “pumping gas, fixing flat tires, lubricating cars, and selling batteries,” Jack explained. “It just wasn’t enough. It was something, but it just wasn’t enough. My grandfather had the chance to get a small Pontiac agency. “So we buy the lot and we clean it up. We are just ready to call the carpenters to come out and put up the new building. All of a sudden, there’s a man here from City Hall. He says, ‘I don’t want you to do any more with that lot. The city is going to take that lot and build a firehouse.’” Jack’s grandfather went to court and asked why the city could not just remodel the nearby firehouse on 10th Avenue, but the fire department argued that it needed a corner lot for the hook-and-ladder trucks. 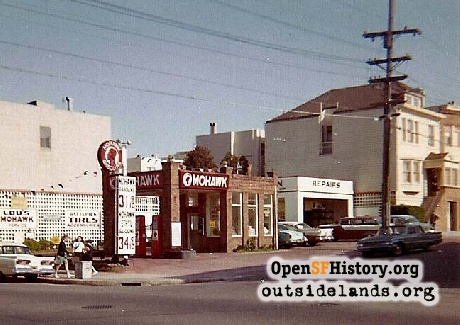 Then the City of San Francisco took the lot by Eminent Domain and things changed for the gas station. “At one time, we had a nice business there,” Jack complained. “It all went downhill” after they had to stop selling cars. Jack’s grandfather gave up on the gas station sometime in the 1950s. The elegant brick gas station building at 16th Avenue and Irving Street when the old Mohawk gas pumps were still in place., circa 1979 - Courtesy of Julie Alden. 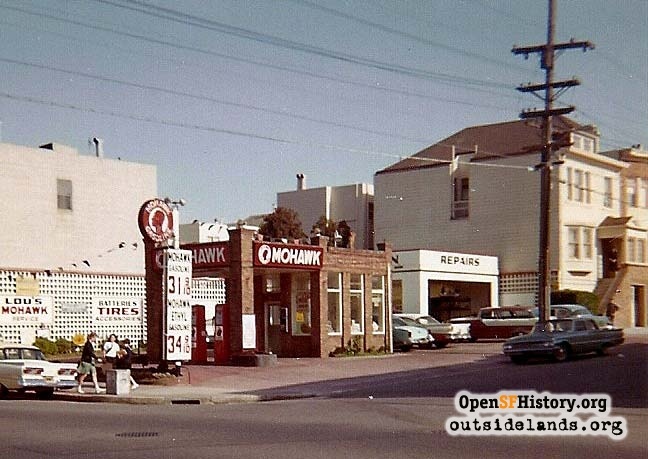 Historians, neighbors, and preservationists pay attention to the brick gas station office that still stands behind a chain-link fence at 16th and Irving. In fact, in 2012, when the white service bay in the back of the lot was being demolished, emails were flying as people worried that this action signaled the end of the gas station. Relief replaced panic, however, when people learned that the demolition permit was only for the service bay. “They said, ‘Okay, we’ll get back to you.’” Jack said in 2007 that he did not hear any more from the city. 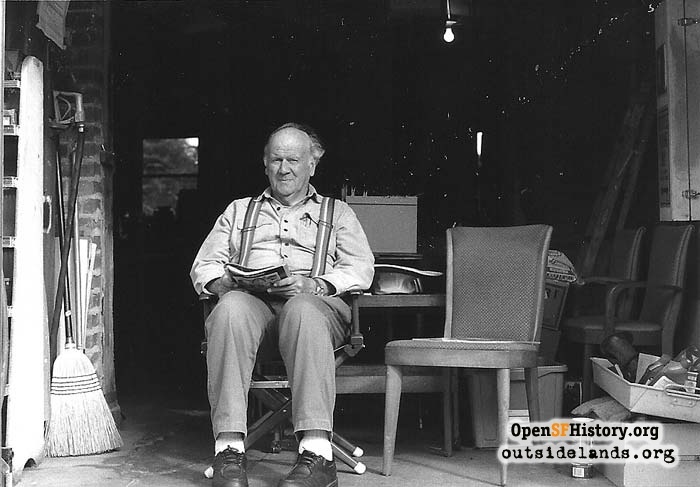 In his later years, Jack Goldsworthy would sit outside his garage on warm, sunny days and greet neighbors and passers-by. - Courtesy of Bruce Eng. 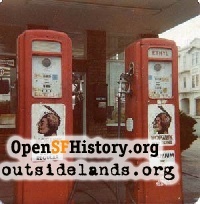 According to San Francisco City Directories, the gas station had several names over the years and was run by different people: Sunset Service Station and Courtesy Service Station (Jack was working there in 1940), Frank and Jim’s Mohawk Service (1960), La Prath Mohawk Service Gas Station (1963), and Louis (later Lou’s) Mohawk Service (1964). One of the last people to run the station (from 1964 to 1980) was Ludwig “Lou” Glowacki. 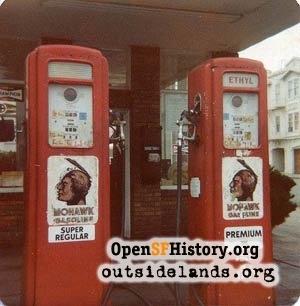 A San Francisco Examiner article in 1980 showed him with the old Mohawk gas pumps explaining why he would likely close the station. In a situation difficult for us to understand now, the article explained that old gas pumps could only show gas selling for less than $1 a gallon. By 1980, gas prices had reached $2 a gallon. For a few years, many stations had been “half-pricing” their gas—doubling the price shown on the pumps. By this time, the Mohawk station on Irving, whose pumps could not go above 59.9 cents a gallon, was engaged in quadruple-pricing. The article noted that two large signs in the window stated that “the price per gallon and the amount of sale is one-quarter of the amount it should be.” The new law required that all old pumps be replaced by new ones before July 1, 1980. Glowacki could not afford the estimated $6,000 required for the upgrade. 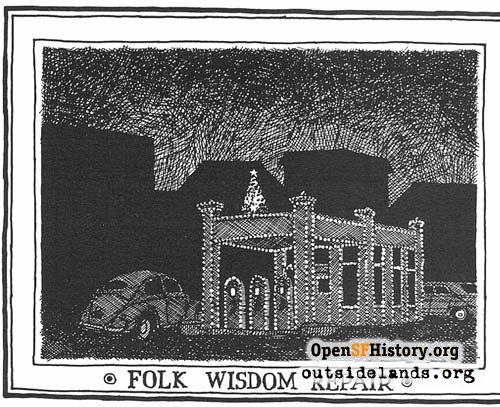 In the 1980s, Tim Grace's Folk Wisdom Repair sent Christmas cards created by artist Doug Nelson. - Courtesy of Julie Alden and Doug Nelson. 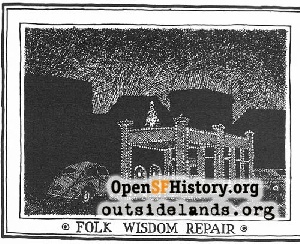 Several years later, Tim Grace renamed the business Folk Wisdom Repair and provided car servicing only (no gas) until the 1990s. Each December, Tim put a decorated Christmas tree on top of the station and sent Christmas cards to customers with illustrations of the station by artist Doug Nelson. 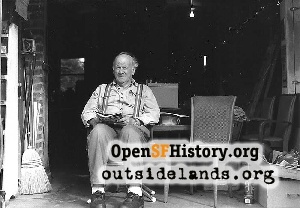 For many years, Jack Goldsworthy owned the corner lot at 16th Avenue and Irving Street. With his passing, no one is sure what will happen to the historic gas station building. For now, it still stands as a reminder of the early years of the growing Sunset District. Jack is remembered as a warm neighbor and friend, someone who loved cars (and fishing), someone who had a great sense of humor and a talent for good storytelling. With Jack’s passing, two treasures have been lost: Jack Goldsworthy, a man “without a mean bone in his body,” and his connection to the beautiful gas station on Irving Street. 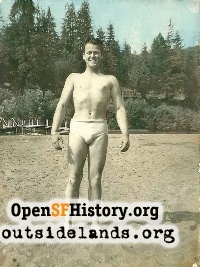 San Francisco City Directory (various years). Malcolm Glover, “The State of California vs. Mr. Glowacki’s Gas Pumps,” San Francisco Examiner, April 4, 1980. The author wishes to thank Bruce Eng, Jack Goldsworthy’s family, Karen Olson, and Julie Alden for their assistance with this article. Page launched 1 July 2013.